Home » Barkerville » How Does It All Work? Visitors often comment on the impressive amount of educational programs, entertainment opportunities, shops, restaurants and activities that are available in Barkerville during our peak season. There is a reason we recommend at least two days to see and do everything. Two days really is the minimum amount of time it takes to make a schedule, then see and participate in all the interpretive events, visit every shop and eating establishment, and peruse every display. One question I am asked repeatedly is: how does it all work? People are interested to find out how so many businesses and programs run so smoothly and simultaneously. It comes down to the fact that the infrastructure of a high season day in Barkerville has evolved over many years to become a web of activity that, when looking at it from the inside, is quite complex. The Barkerville community has several areas of specialization. We have year-round administrative departments, which include curatorial, finance, visitor experiences, marketing, security and maintenance. In early May these departments are joined by the seasonal merchants and interpretive teams, who have also been working all year to get ready for the busy season but who don’t become active onsite until Spring. Barkerville’s historical interpretation, otherwise known as the folks whose job it is to bring life to the town’s streets and buildings, is organized by a contract system. Each contract holder is responsible for a specific area of our history. Over the years new interpretive programs have been introduced and integrated, and currently the breakdown looks like this: Early Justice (the Judges), Home Life (the Wendle House and Schoolhouse), Blacksmith (Cameron & Ames), Mining in the Cariboo (the Waterwheel, etc. ), Historic Chinatown (Chinatown tours, Chinese school, Chinese music), and Historic Street (town tours, street scenarios, discourses). Each contract holder hires interpreters to play historical characters in town, and each contract holder is usually an interpreter too. Many interpreters are actors, some come from specific trades (like blacksmithing) and some are historians who have discovered theatrical interpretation through their academic careers. Every contract holder is responsible for basic administration as well as the artistic direction of the program in question. Interpreters from the various contracts all interact, in character, with visitors and with each other. Barkerville is also fortunate to have St. Saviour’s Anglican Church as part of our seasonal lives. The role of Reverend Reynard, St. Saviour’s original minister, is usually played by a seminary student who is addressed as a historical character on the streets of town. The reverend interprets the history of St. Saviour’s and leads daily cemetery tours, while at the same time conducting real services inside the church. Our Reverend Reynard is an interpreter of history as well as a spiritual leader within our community. The piece that completes the puzzle of our peak season community is the merchants of Barkerville – the businessmen and businesswomen who run the restaurants, shops, bed and breakfasts, activity-based businesses like the stagecoach, gold panning, and the Theatre Royal. Barkerville’s merchants are also, in large part, interpreters of history, and run their businesses within a historical framework. Our merchants aren’t just good businesspeople, they are also frontline historians who are willing and able to communicate the story of the gold rush through their wares, staff and customer service. Like our interpretation programs, the scope of Barkerville’s mercantile district has increased as the site has grown and evolved. As the museum called Barkerville has developed over the years, programs, activities and businesses have come and gone and each one has had to find its place within an incredibly rich and evolving framework. The result for you, our visitor, is a heritage experience that is changeable, adaptive to your needs, and bursting with the potential to educate and entertain for as long as your visit allows. 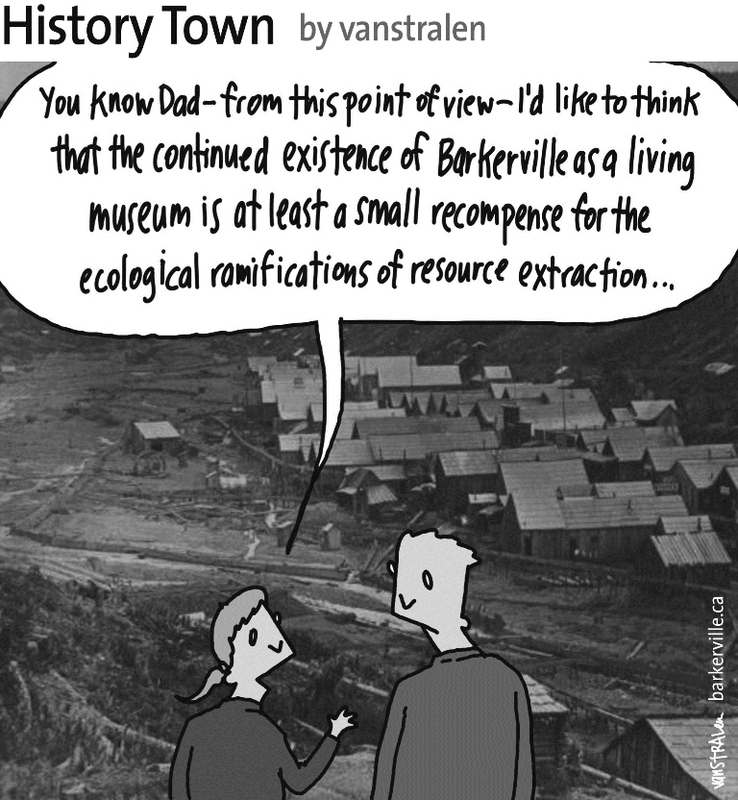 The above one-panel cartoon by Dirk Van Stralen, with accompanying editorial by Danette Boucher, is the fourteenth of twenty weekly entries that will be logged – and subsequently blogged – as part of a 2013 collaboration between Barkerville, British Columbia and the Prince George Citizen aimed at introducing some of the quirkier advantages to living, working, and playing in the Cariboo Goldfields. We hope you enjoy!